Home » Magazine » National » Mr Indispensable? Saba Naqvi	May 21, 2001 00:00 IST Mr Indispensable? The office of Prime Minister Atal Behari Vajpayee has often been diagnosed as being RH+ (Reliance-Hinduja positive). The Reliance connection has been much in the news in recent months. The pmo has been accused of influencing several policy decisions to blatantly favour the Ambani-owned Reliance group. But last week the focus shifted from the Ambanis. It became clear that the Hindujas, who face criminal charges in the Bofors pay-offs case, command as much clout in the Vajpayee establishment as the Ambanis. And, if revelations tumbling out in the British press are true, then their man in the pmo is none other than the principal secretary, Brajesh Mishra. A leaked letter revealed recently that in the aftermath of the 1998 Pokhran nuclear tests, Vajpayee's emissary, Mishra, took the help of the powerful London-based nri family to get an appointment with British prime minister Tony Blair. Even worse, the controversial brothers, who had by then been identified as one of the main recipients of the Bofors pay-offs and were being investigated by the cbi, actually accompanied Mishra to 10, Downing Street where he handed over a letter from the Indian prime minister to his British counterpart. The Hinduja bombshell could not have exploded at a worse time for Mishra—the Sangh had just about eased off its campaign against him, and the prime minister is believed to have decided to buy peace with Mishra's critics by relieving the principal secretary of his dual charge as the National Security Advisor. pmo sources argue that he's being relieved as the post will soon be redundant with the decision to create a new position—the chief of defence staff. Mishra's detractors now see an opportunity to sharpen their attack. And it will not be easy for the PM to convince the Sangh that his principal secretary's liaison with the Hindujas was in "national interest". bjp hardliners, who have been baying for Mishra's blood over his influencing the bureaucracy on key issues, are likely to use the Hinduja link as a bargaining chip. Caught on the backfoot after the latest revelations, sources say that a quid pro quo arrangement is being thrashed out between the Sangh and Vajpayee, who is keen to retain his principal secretary on whom he depends heavily. One solution being worked out is that the rss gets one of its own men in the pmo to work directly under Mishra. This formula, reportedly, has the backing of rss organising secretary Madan Das Devi. Leading the race for this post have been Tarun Vijay, editor of the rss mouthpiece Panchajanya, and Seshadri Chari, editor of the rss weekly Organiser. Finally, after some debate, the outspoken Tarun Vijay was apparently ruled out for his close proximity to North Block, the domain of home minister L.K. Advani. Devi has, therefore, been pushing for the appointment of Chari in the pmo. Of the entire rss top brass, Vajpayee has the best working relationship with Devi. The argument being put forward for Chari's appointment is that he has maintained an equidistance from both the Vajpayee and Advani camps. Editor of the Organiser for close to a decade, Chari was at one time considered very close to Murli Manohar Joshi. But unlike some other rss functionaries, he has always maintained a very cordial relationship with Vajpayee's pmo. In charge of handling the press for the rss, Chari is also believed to have acquired the necessary sophistication for the job—he recently accompanied the prime minister to Iran where he also doubled up as Doordarshan's correspondent. It is, therefore, possible that in about a fortnight, Chari could be asked to fill the vacancy created by the departure of Kanchan Gupta, who quit the pmo some months ago. Gupta, who enjoyed the rank of a director, had worked directly under Brajesh Mishra. The rss is selling Chari's appointment to buy peace with Mishra. Says a senior rss functionary: "If the two men work together, it'll send a message that all is well between the rss and the pmo." In the meantime, some long overdue changes have already been made in the pmo. The controversial osd, N.K. Singh, is now in the Planning Commission. Economic issues will now be handled by Prodipto Ghosh, a 1969 batch ias officer, who was appointed additional secretary in the pmo last week. Ghosh's appointment is a clear pointer that Vajpayee wants to play safe and does not want to appoint any controversial officer. Mishra's only usp is his proximity to the PM. But he is not short on enemies and his style of functioning often attracts criticism. The constant one-upmanship with foreign minister Jaswant Singh, for instance, has led to many red faces in the foreign office. His supporters have already made it known that they disagree with Jaswant's hasty endorsement of George Bush's nuclear shield. Episodes such as this have made Jaswant one of Mishra's strongest critics. Though both Jaswant and Advani rarely see eye to eye, they are united in their opposition to Mishra. But if Mishra has survived in the pmo all this while, it is because of the unstinted backing of prime minister Vajpayee. Many describe him as the prime minister's minder—bureaucrats and ministers narrate instances of Vajpayee nodding off at important meetings and being propped up by Mishra. Many believe that by removing Mishra, the prime minister would virtually cripple himself. 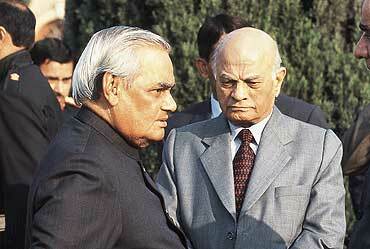 For, as far as Vajpayee is concerned, the only man who has ever been indispensable for him is Brajesh Mishra. That is why Vajpayee has gone out on a limb to retain his principal secretary in spite of all the criticism and controversies. He has also made it clear that he will not get rid of Mishra under pressure. All the same, if Mishra becomes a political liability, Vajpayee may have no choice but replace him. However, the PM's aides believe that many of the critics of the prime minister's office have been placated by the shunting of N.K. Singh. Also, the plans to cut off one of Mishra's dual responsibilities has deflected much of the Sangh's ire. Even Vajpayee's peace overtures to Advani have helped contain the hardliners. But should the rss candidates for placements in the pmo be rebuffed, then the Sangh could turn on the heat and their target once again could well be Brajesh Mishra. The principal secretary's friends believe that all his problems arise from the enmity with sjm ideologue S. Gurumurthy, one of the most influential lobbyists for the Sangh parivar. But now, for the last some months, Gurumurthy has also fallen from the pedestal he once occupied. Senior rss functionaries have now started to believe that he set the parivar to target Mishra at the behest of certain corporate lobbies. With assembly elections behind him, Atal Behari Vajpayee is now under pressure to take some important decisions. For one, he has to decide who will eventually man his office. Will he relieve Mishra as the national security advisor or will he opt for the safer option of appeasing the Sangh by inducting some of its blue-eyed boys into the pmo? On that rests the future of a prolonged, unseemly tangle.